Earlier this week, Micromax announce its first HD smartphone with a quad-core processor called the Micromax A116 Canvas HD and it seems that the device which will be available in the first week of February already has competition lined up. In responce to Micromax Quad-Core, Karbonn also preparing to set sail with their quad-core Karbonn S1 Titanium, which will challenge the Canvas HD. Both of these smartphone makers offer smartphones at much less cost (in short bang for a buck), and these smartphone even boats quad-core processors, thi is the reason behind me comparing these two phablets. 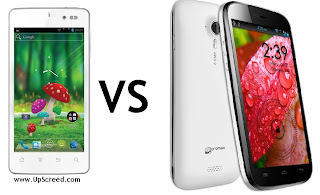 The whole specification of Karbonn is not revealed yet, so I’ll just compare them with whatever we know. If you have Choice to take 1 from these which you will take?? tell us in comments.